A model of clarity and precision, Bennett's New Latin Grammar uses copious specific examples from primary sources to teach Latin's inflections, syntax, sounds, accents, particles, and word formations. This reprint of Bennett's 1908 revised grammar remains a highly regarded, widely-used resource both in and out of the classroom. Traditional in its structure and exhaustive in its scope, the descriptions of all things grammatical remain accessible and current after over 100 years of Latin pedagogy. "The object of this book," stated Bennett in the preface to his 1894 edition, "is to present the essential facts of Latin grammar in a direct and simple manner, and within the smallest compass consistent with scholarly standards." This is truly Latin grammar at its finest: logical and succinct… indispensable for undergraduate majors and minors and even clear enough to use at the secondary level. It is simply the best. What a joy it is to have Bennett’s New Latin Grammar available again to a wide audience of students and instructors of classics! The Grammar presents clearly and precisely with short, specific examples from primary sources the inflections and syntax of Latin and gives a fundamental understanding of the sounds, accent, particles and word formation in the Latin language. In addition to the clear presentation of these essential principles of grammar and syntax, Bennet’s Grammar provides a student with a brief, but well defined history of the Indo-European family of languages, and also of the stages of development of the Latin language. Students and instructors will find especially helpful Bennett’s sections on prosdy, the Roman calendar, Roman names and the definitions and examples of figures of syntax and rhetoric. 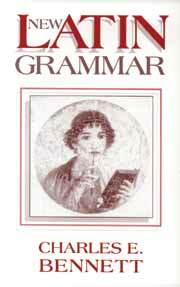 I strongly recommend Bennett’s Grammar as an essential tool in the learning of every level of instruction. Traditional in its structure and exhaustive in its scope, this is a perfect tool for any Latinist.